However much a couple opting for separation may try not to get children involved, they cannot be kept away from the mess. It is extremely important to remember that a child needs both mother and father in his life and anything less can prove demanding for a child irrespective of his age. In a series of two articles we discuss issues related to children and divorce. 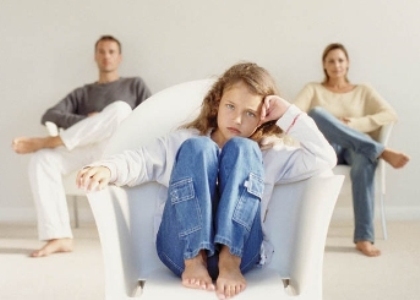 For children, divorce of his or her parents is a painful, stressful and confusing situation. Irrespective of their age uncertainty creeps into their lives which may take the form of anger, resentment, bitterness and aggression. As a parent, it is your responsibility to make the process of divorce least painful and stressful for your children. In the following sections we discuss some of the tips that can prove helpful during unfortunate times. The first step towards this is to have a stable atmosphere in the house, being attentive towards the child and maintain a positive and a reassuring attitude. With uncertainty on your mind and unsettling environment around it can be extremely challenging to make a child feel comfortable and supported. Work consciously to be patient and be reassuring in your behavior. Listen and listen a lot to what your children have to say. Do not allow the child’s routine to be disrupted. Everything that you do has to make the child feel that he can rely on you for stability and care. Maintaining a working relationship with your ex spouse can prove reassuring for the child. We understand it is easier said than done, but it cannot be denied that the onus for making it smooth for the children rests on you. It is equally important to be sensitive towards the needs of your child. To begin with for your child it is the presence of both that is important. If your child is not staying with you take time out to make calls, write letters and ask a lot of questions from your child. Your involvement in his day to day activities makes him feel loved and important in your life. The next thing that a child wants is not to a subject matter of argument amongst the parents. When a couple fights for child, he tends to feel guilty and responsible for the mess. As mentioned above a child wants the presence of both parents in his life. Do NOT force a child to make choices. Do not feel jealous of the time that the child spends with your ex. Stop treating the child as a messenger. It is not his job to pass on messages from one to another. We understand it is unchartered territory but you can successfully pass through this and ensure that your children emerge loving and confident. Remember to talk positive and nice things about your ex when you mention them in front of the children. Unkind things for a parent may not go easy with a child. It might be like walking on thorns but it is important to tell your child that you are heading for a divorce. What you can do is while sharing information with your child filter and keep it as light as possible. Keep your emotions in control when you speak to your child. Be ready to answer a lot of questions. The questions may come after some time or immediately. However stressed out you may feel, the truth remains that you owe them an explanation. Give an explanation in words and manner that they can understand. It is important to tell the truth. Keep the reasons for divorce straight and simple. Avoid weaving long and complicated stories. Children are very intelligent and can understand what is happening around them. Tell them that there are no reasons why you will stop loving them. Express your love for them. Bring up the changes that your divorce will bring. Avoid blaming your spouse for the family breaking apart.